According to members of the Committee, the Mayor of Veldhoven “did not make any effort” in seeking for other solutions. They the mayor to revoke his decision. But that advice puts Mayor Mikkers aside: he insists that he had taken the right decision. At the beginning of April, the YPFDJ, an organisation associated with the Eritrean government, organised a meeting at the Koningshof conference in Veldhoven. 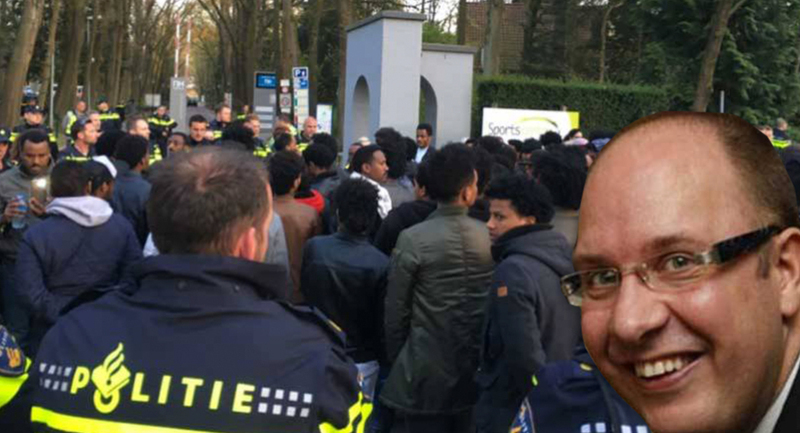 More than 120 asylum seekers who fled from Eritrea demonstrated at the gates of Koningshof against this meeting. When outrages broke out, Mikkers cancelled the conference. The Committee members agree with the mayor that ‘serious riots ‘ took place. Also according to them, the fear of more riots was justified and intervening was therefore necessary. However, according to the objections committee, this does not mean that the conference could be bannedentirely because the riots were not caused by the Conference goers but by others. The mayor already indicated that, according to him, there were simply not enough policemen available to guard the entire site of Koningshof, but according to the objections Committee, Mayor Mikkers does not sufficiently substantiate that assertion. In an attempt to do so, Mayor Jack Mikkers writes that both Koningshof and the police were indicating that they could not guarantee the safety of the conference goers and the protesters. After the protesters were arrested “the police explicitly asked me to make use of my emergency powers and to ban the conference”. The Conference guests have requested compensation. However, the Objections committee does not rule on this. In the opinion of the Commission, the mayor has to take a position on this. Therefore, Mayor Mikkers does so in his letter: he rejects the compensation. For the objectors, the issue is now open to the court. “It’s up to my [PFDJ] to decide whether we’re going to the court after this or not,” lawyer Bart-Jan Walraven responds. He represents the conference goers.